1960 Ideal 12" Shirley Temple Raincoat & BONUS! 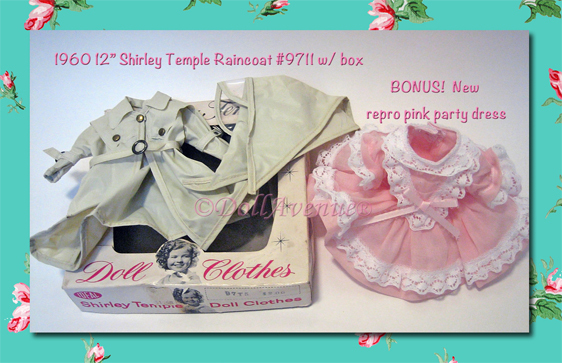 Catalog > 1960 Ideal 12" Shirley Temple Raincoat & BONUS! Darling 1960 12" Shirley Temple Vinyl Raincoat Set #9711 with box labeled 97T5. The set includes a beige colored vinyl raincoat with metal buckles on the sleeves and waist belt and matching vinyl scarf with clear plastic visor. The outfit came to me in this original Shirley Temple outfit box, marked 97T2, which I believe is correct for the outfit. The outfit can be seen on p.199 of the Collector's Guide to Ideal Dolls by Judith Izen. The box is in poor condition, but still intact, though the plastic window has separated (the old glue holdin git to the box has dried and aged). It still retains it's original price tag of $2.00. Included is a BONUS reproduction pink party dress that is crisp, full, and layered with lace. It's absolutely adorable! *Click on the link below to see a large view of this outfit & bonus dress.